Wine+chocolate+raspberries=pure deliciousness! I actually wanted to us cherries for this recipe, but I guess it’s not really cherry season so I couldn’t find any. Next time I make these I’ll try them with cherries. I used Apothic red wine for this but you can use your favorite. This is a fairly simple recipe with just a little preparation and waiting for the raspberry swirl. The results are definitely worth it! Place all ingredients in a small saucepan and bring to a boil. Reduce heat and simmer about 20 minutes or until mixture is reduced by half. Strain mixture through a fine sieve and set aside. In a large bowl add wine, boiling water, cocoa powder, and melted chocolate. Using a wooden spoon or spatula, mix until smooth. Add melted butter and oil continue to mix. Next, add the vanilla and eggs. Mix until incorporated. Add sugar and continue to mix. Then add flour and salt. Fold in sour cream and add chocolate chips. To prepare brownies, place a long sheet of parchment paper over an 8×8 baking dish so that there is some hanging over on all sides. This will allow for an easy clean up and also help to lift the brownies out of the pan. Pour batter in dish and smooth out. Place spoon fulls of the raspberry mixture on top of the brownies then take a knife and swirl it into the batter. Bake approximately 1 hour and 20 minutes. After an hour check the brownies to see if they are set. If they are not cook an additional 10-20 minutes. Place a toothpick close to the center, if a few crumbs come out that is fine, the brownies are ready. Place brownies on a rack to cool for 30 minutes. After 30 minutes lift brownies out of the pan and continue to cool on rack. After brownies have completely cooled, cut and enjoy. Wow these look amazing! 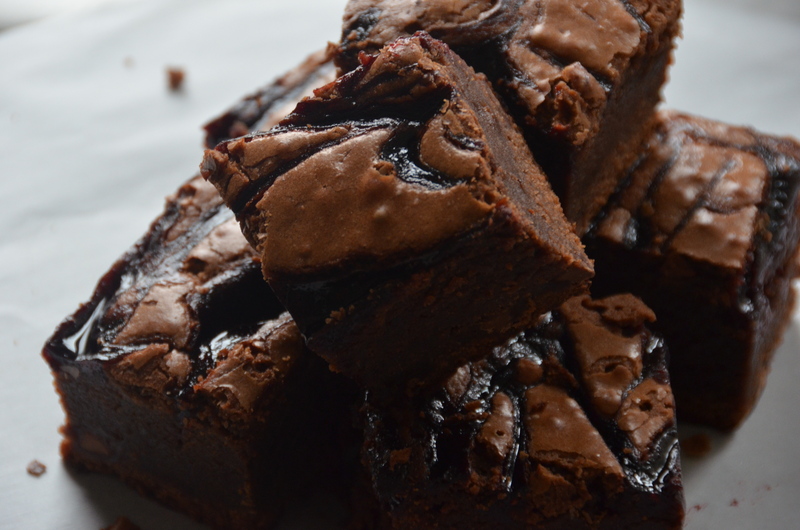 I never thought to add red wine to brownies, but now it seems like such a no-brainer. Nice work! I have a question about the eggs- it says to add 2 eggs and 2 egg yolks. Was this a mistype, or do you add 2 whole eggs along with 2 yolks? I apologize if it was confusing. It’s 2 whole eggs plus 2 egg yolks. Thanks for checking out the recipe!